This Saturday, August 25 at 2 p.m. at the Central Library, we’ll be having a very special screening of the 1953 film War of the Worlds based on the book by H.G. Wells. This is a wonderful opportunity to see this classic film and experience a discussion of the making of the film featuring special guests Ann Robinson, lead actress, and Justin Humphreys, who worked with the film director and producer George Pal’s estate. This event is held in conjunction with the Pasadena Museum of History’s Dream the Universe exhibit. 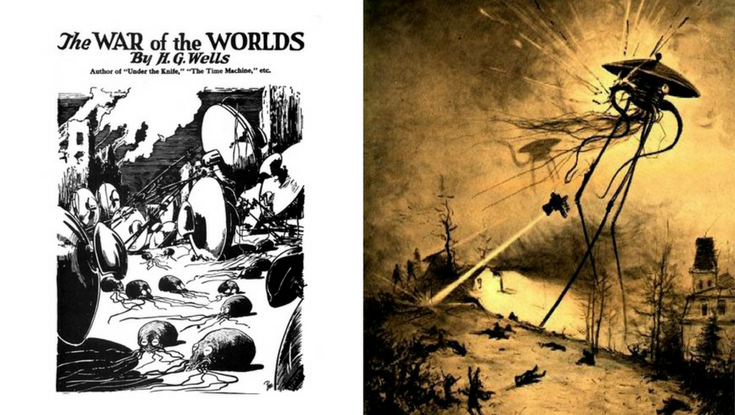 If you want to dive even further into the cultural touchstone that is The War of the Worlds, take a look at the books and resources below that present a look at H.G. Wells original work and adaptations as well as the 1938 Orson Welles radioplay broadcast that terrified millions of Americans. When massive, intelligent aliens from Mars touch down in Victorian England and threaten to destroy the civilized world, humanity’s vaunted knowledge proves to be of little use. First published in 1898, H.G. Wells’s masterpiece of speculative fiction has thrilled and delighted generations of readers, spawned countless imitations, and inspired dramatizations by such masters as Orson Welles and Steven Spielberg. The War of the Worlds is a fantasy that is both startlingly up-to-date and in touch with the most ancient of human fears. From the pen of legendary science fiction author and futurist, H.G. Wells, Dark Horse Comics is proud to present their adaptation of the most famous science fiction novel of all time: The War of the Worlds! In the closing years of the 19th century, the genteel tranquility of Victorian England is shattered by the arrival of an invasion force from the red planet – Mars! Methodical and merciless, the Martians are intent on nothing less than the conquest and subjugation of the human race. Told from the point of view of an ordinary man caught up in the carnage and chaos, witness firsthand how the then greatest empire in the world is brought to its knees by the Martians’ cool alien intellect and the implacable heat ray! Disgruntled, divorced father Ray Ferrier (Cruise) is struggling to connect with his estranged kids, who have been dropped off by their mother for the weekend, when a severe and unusual lightning storm leaves his New Jersey neighborhood powerless. Over the course of the next few hours, it becomes obvious that this was not a storm at all, but rather the first sign of a worldwide alien attack. Emerging from the ground in multi-legged tripod-like machines that have apparently been stored beneath the earth’s surface since before man’s time, these aliens begin the process of waging a long-planned war on our planet. In a remake of the classic radio drama, horrifying life forms emerge from a strange object in a New Jersey farmer’s field, marking the beginning of an invasion from Mars. The infamous radio play that triggered a nationwide panic in 1938 is recreated by actors from Star Trek, including Gates McFadden, Leonard Nimoy, and Brent Spiner. This fun compilation, prepared by the staff of Sourcebooks for science fiction and radio history fans, reprints the full text and illustrations of Wells’ famous short story published in 1897, and the adapted radio play written by Howard Koch, and sets the public reactions and literary influences in historical context. The CD contains the 1938 radio broadcast by Orson Welles and the ensuing press conference. On the evening of October 30, 1938, radio listeners across the United States heard a startling report of a meteor strike in the New Jersey countryside. With sirens blaring in the background, announcers in the field described mysterious creatures, terrifying war machines, and thick clouds of poison gas moving toward New York City. As the invading force approached Manhattan, some listeners sat transfixed, while others ran to alert neighbors or to call the police. Some even fled their homes. But the hair-raising broadcast was not a real news bulletin-it was Orson Welles’s adaptation of the H. G. Wells classic The War of the Worlds. In Broadcast Hysteria, A. Brad Schwartz boldly retells the story of Welles’s famed radio play and its impact. Did it really spawn a “wave of mass hysteria,” as The New York Times reported? Schwartz is the first to examine the hundreds of letters sent to Orson Welles himself in the days after the broadcast, and his findings challenge the conventional wisdom. Few listeners believed an actual attack was under way. But even so, Schwartz shows that Welles’s broadcast became a major scandal, prompting a different kind of mass panic as Americans debated the bewitching power of the radio and the country’s vulnerability in a time of crisis. When the debate was over, American broadcasting had changed for good, but not for the better. As Schwartz tells this story, we observe how an atmosphere of natural disaster and impending war permitted broadcasters to create shared live national experiences for the first time. We follow Orson Welles’s rise to fame and watch his manic energy and artistic genius at work in the play’s hurried yet innovative production. And we trace the present-day popularity of “fake news” back to its source in Welles’s show and its many imitators. Schwartz’s original research, gifted storytelling, and thoughtful analysis make Broadcast Hysteria a groundbreaking new look at a crucial but little-understood episode in American history.